China stocks have ballooned to unbelievable heights this year, generating huge returns for retail investors who have poured their savings into the market. But with concerns over a bubble growing, those same investors are now in a precarious position. The market's strength is "just a mirage," said Vincent Chan, managing director of equity research at Credit Suisse. There will be a final trigger that "comes as an accident, which nobody can really foresee ... retail investors, if leveraged, are usually the first group of people ... that lose." Those retail investors -- think grandma and grandpa -- have benefited greatly as China stocks outperformed their international rivals. 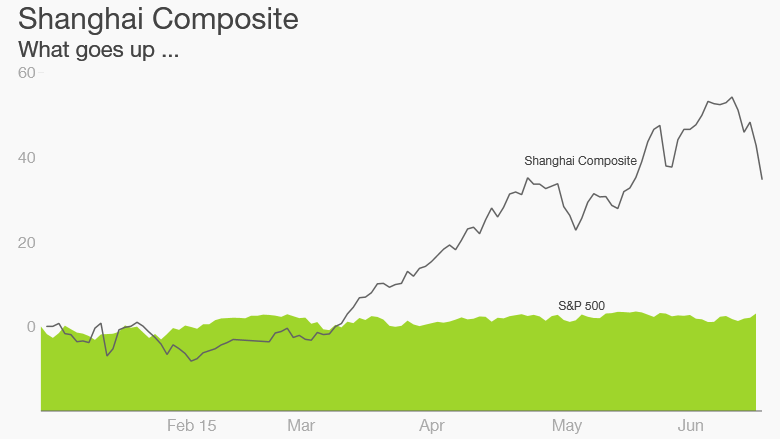 The Shanghai Composite has surged nearly 40% this year, and the Shenzhen Composite is up more than 90%, easily making it the world's top-performing index. But many analysts say the boom is built on government stimulus and investor frenzy, rather than robust economic fundamentals. In fact, first quarter GDP growth was China's weakest since the financial crisis. Already cracks are showing -- Shanghai stocks dropped by 13% last week, something that could make retail investors rethink their financial strategy. Earlier in June, investors abruptly pulled out nearly $7 billion from Chinese funds and ETFs in a single week, according to financial data firm EPFR. Retail investors shifted their money into stocks over the past year as the property market -- a traditionally popular investment for the Chinese -- deflated. At the same time, state media publications urged the public to invest in stocks, and other government initiatives opened up markets to foreign investors. Many investors were unable to resist, especially when friends and acquaintances were reaping double digit returns. "[When] the market is on a streak, more and more people are coming in," said Mr. Shi, a retired driver who invests in stocks. "If it wasn't like this, nobody would show up [to the brokerage]." The rise in investor interest has resulted in a ton of turnover -- stocks are switching hands very frequently, with monthly trading volume now six times larger than China's $10 trillion domestic market cap, according to Credit Suisse. "This kind of ultra-active trading activity is definitely a very worrying factor," Chan wrote in a research note. Cha Er Si, a young, first-time investor, said that he and his friends are even using margin financing, the practice of buying stocks with borrowed money. According to Oxford Economics, 86% more margin trading accounts were opened in 2014 compared to the previous year. In December alone, 700,000 new accounts were created. Some have speculated that the Chinese government has been quietly pulling strings in the background, trying to engineer a sustained bull market. But that's a risky game to play, Chan warned. "I have never seen any country successfully manage a stock market up or down ... [it] will go crazy, and then collapse," he said.